Laramie: A Gem City Atlas is the result of a project initiated by the UW MFA Creative Writing Program, which invited Eminent Writer in Residence Rebecca Sonlit to work with students to rethink and re-map Laramie and the surrounding area. The exhibition features 16 maps created by UW students and a few community members. 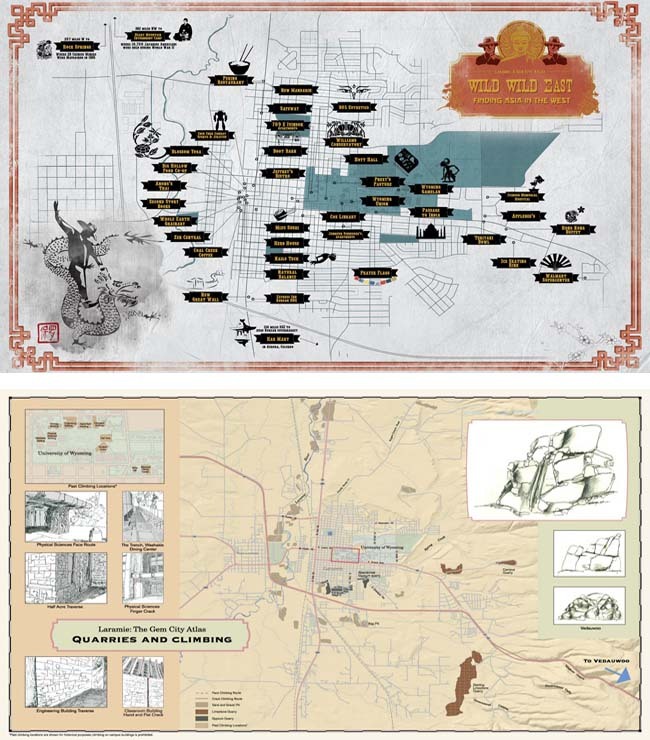 Each map contains unique and sometimes quirky landmarks that contribute to Laramie‘s culture—from saloons and salons to areas of beetle kill, missile silos and ghost sightings. In addition, local and student artists created original artwork in response to the data on the maps. This artwork accompanies the maps in the exhibition. The project is an echo of Solnit’s book “Infinite City: A San Francisco Atlas,” which examined the factors that make up a city and how maps can create a visual record of goods, services and people. Solnit has authored 11 other books, including “A Paradise Built in Hell: The Extraordinary Communities that Arise in Disaster” and “The Technological Wild West,” for which she received a Guggenheim award, the National Book Critics Circle Award in criticism and the Lannan Literary Award. Laramie: A Gem City Atlas and Solnit’s visit to UW was co-sponsored by the Albany County Public Library Foundation, the Wyoming State Legislature through the Eminent Writer in Residence Endowment, the MFA Creative Writing Program, the UW Art Museum, The Haub School of Environment and Natural Resources, and the UW College of Education Social Justice Research Center. Top: LuLing Osofsky, Paulius Staniunas, and Shizue Siegel, Wild Wild East, 2011, ink on paper, 22 x 34 inches, courtesy of the UW MFA in Creative Writing Program.